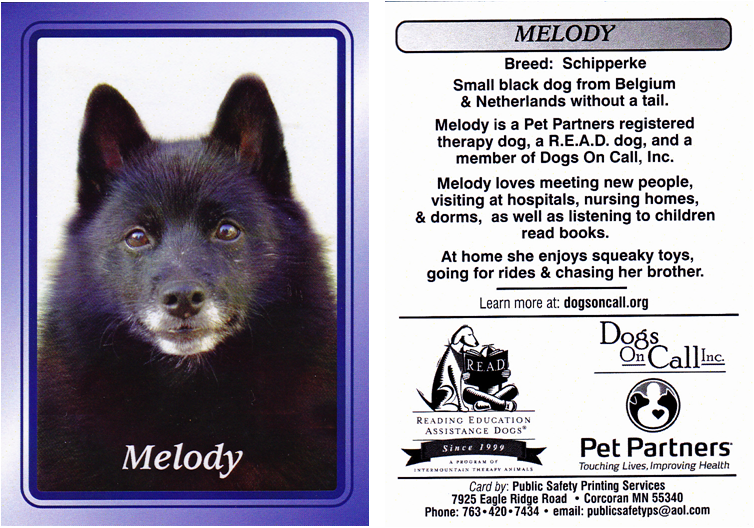 Consider a Trading Card for your Therapy Partner! When you introduce your animal partner to a reader in a library or school, a patient in a hospital, or a nursing home, you are expressing an act of unselfish caring that few others do. By sharing a trading card like the ones shown here you can take that selfless act one step further. You can leave them with a lasting memory of the love and comfort you and your partner took time to share. In some cases, it can be almost as priceless as the visit itself. 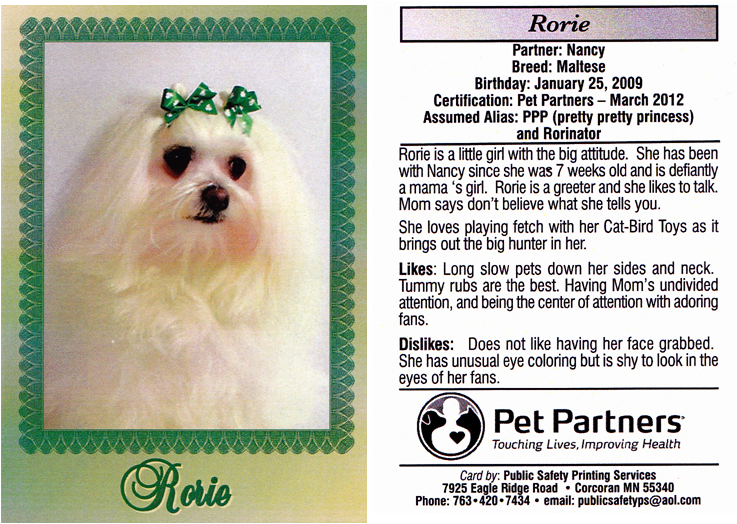 I will design a unique card just for you and tailored to fit your therapy animal's personality. 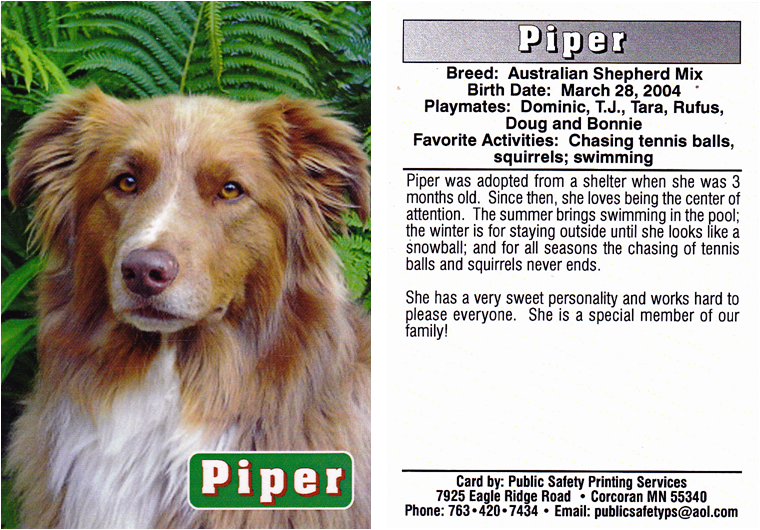 Provide a high resolution photo of your animal partner, preferably a digital photo of 8MP or higher. Be sure to provide an un-cropped photo with plenty of room around your animal. I will crop it as necessary during the design process. Create a Word (.doc) document listing what you want others to know about your partner. 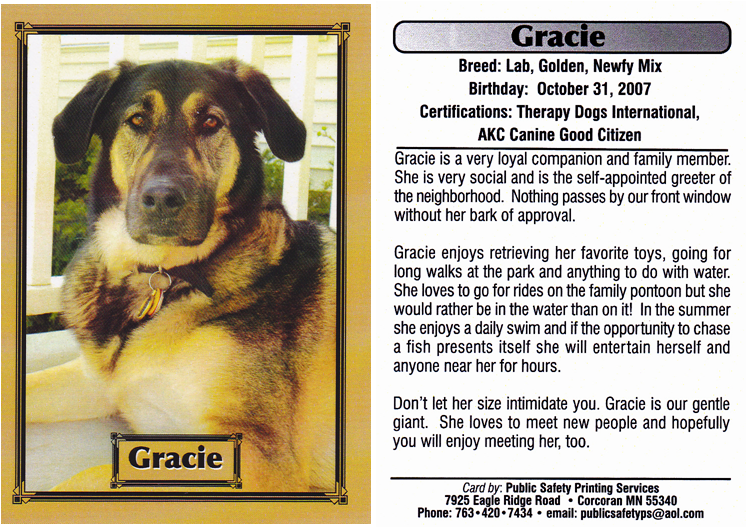 Refer to the sample cards on this page for an idea of how many words will fit on the card. If you have color preferences, let me know so I can include those in the design. Email the picture and Word document to me. You can also send a CD and send via postal mail. If you mail a photo print, be sure that it is printed on glossy paper. I will create three or four versions of what your card could look like and will email these sample ideas to you. As you review the samples, keep in mind you can change any component to suit your preferences. This is your card with your beloved animal on it, I want you to be happy with it! If nothing appeals to you, we simply start over. I want to be sure you're happy with the card and this wonderful memento from your therapy partner. Once you approve the final version and mail a check or money order payment to me, I will send the cards to you. 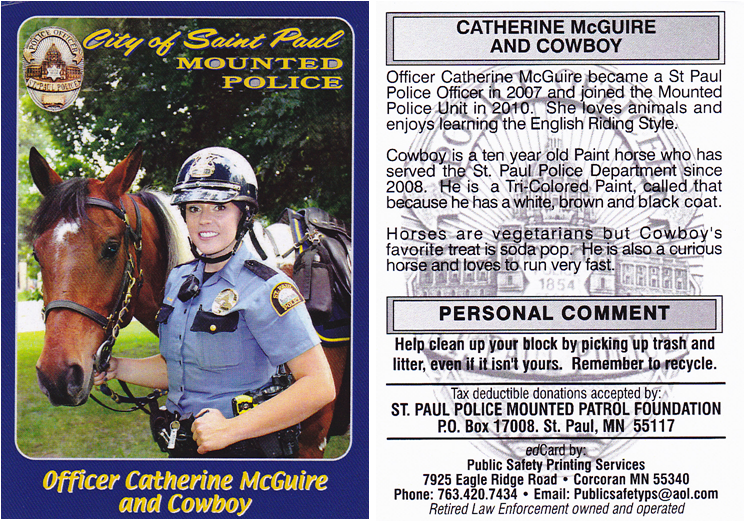 The front of the card is full color and the back is black and white as shown on this page. 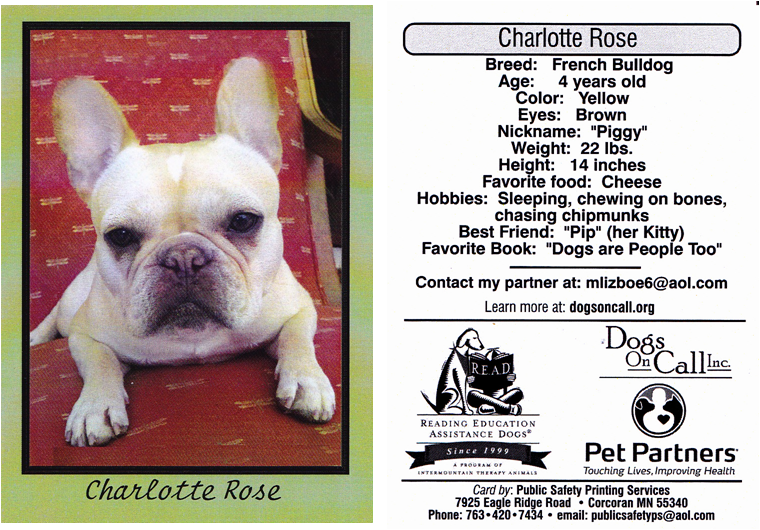 All cards include a glossy UV coating on the front to enhance the photo and protect it from fading. Shipping is the actual cost of postage, usually $6-$10. Public Safety Printing Service (PSPS) is a one man operation owned and operated by Lee Wanglie, a retired Police Officer. Due to life threatening injuries sustained during a shoot-out with an armed robber many years ago, he was forced to take a multi-year hiatus out of the middle of his service. He was eventually able to return to service and finish his career. After retiring from the policy force, Lee returned to college and obtained a degree in Graphic Arts. 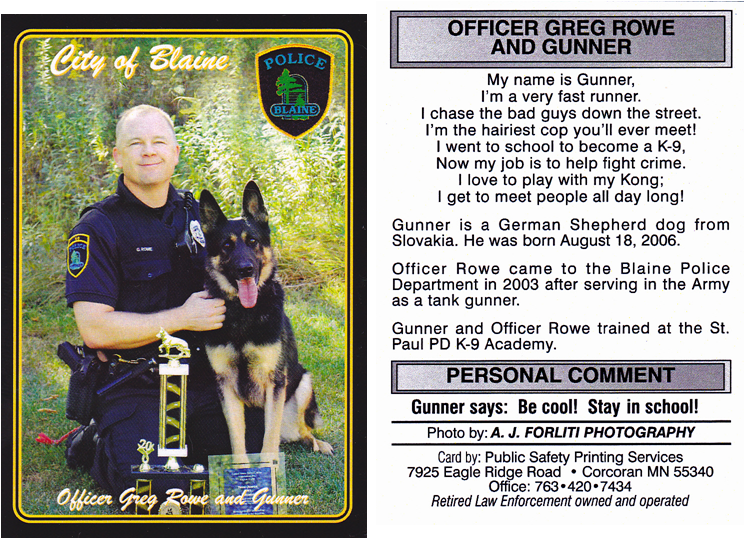 Serendipitously, he was given the opportunity to design and print trading cards for local K-9 officers. 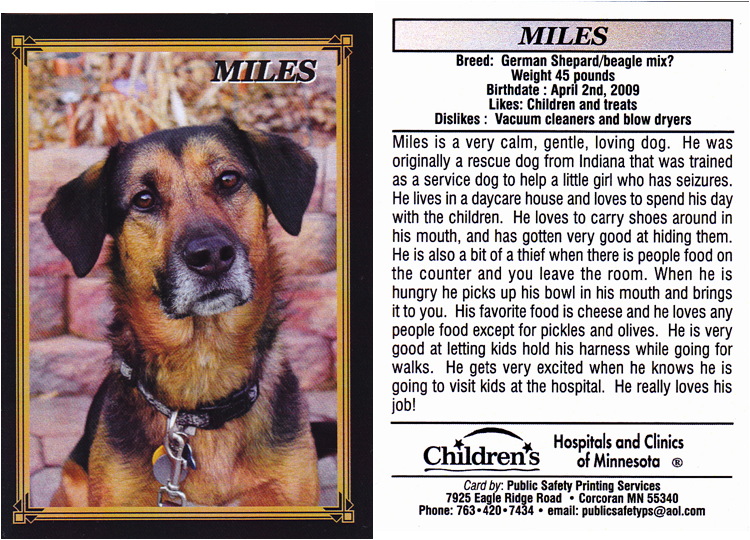 He then created cards for the bomb sniffing dogs belonging to the Mall of America Security Division. 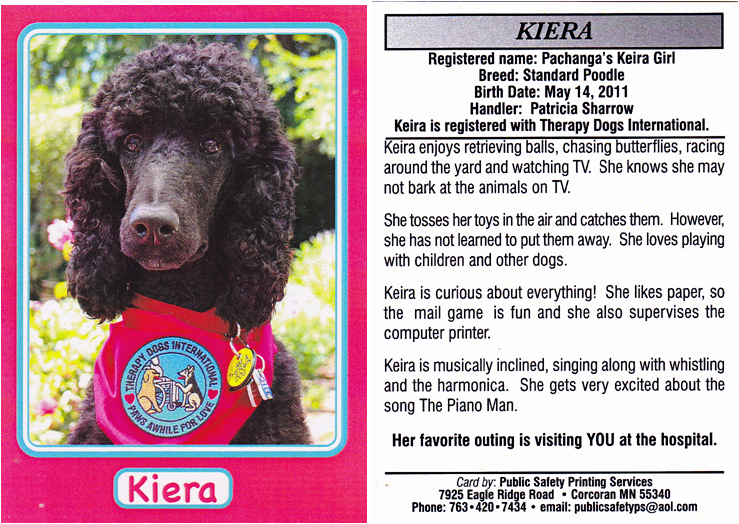 A well-known therapy dog handler in the Twin Cities, Dave Kettering, received one of these cards and decided he needed one for his therapy partner, Sasha. 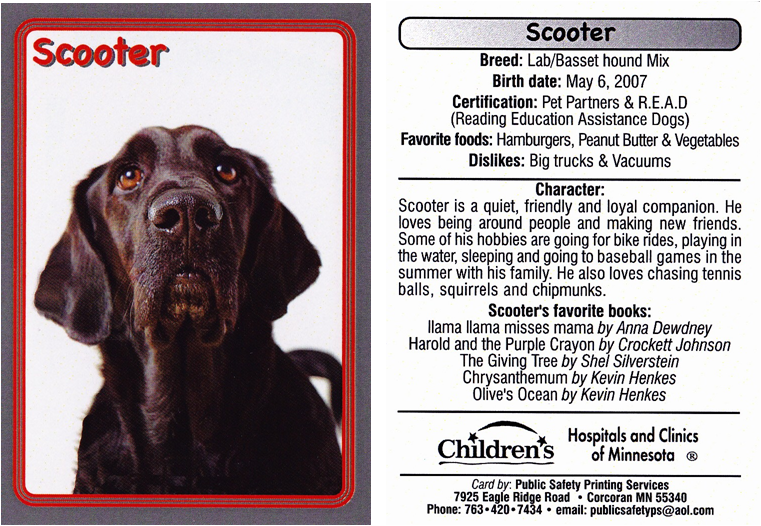 Since that time, Lee has had the sincere pleasure of designing and printing cards for many, many therapy animals and R.E.A.D. teams.